The dog days of summer have arrived with a thud, and August is still to come. In this hot, sticky weather, you want a wine that’s light (especially on the alcohol), lively on the palate and long on the fruit. A savvy summer choice on all counts? Willi Schaefer, an estimable Riesling producer from Germany’s Mosel region, especially from the current — and highly touted — 2011 vintage. German Riesling is not the hard sell it once was. Long a darling of wine geeks and scribes (including moi), it has finally gained traction here through its palate-pleasing excellence, overcoming the common misperception that it is sickly sweet, a la Blue Nun Liebfraumilch. And since 2008, inspired by Riesling fanatic Paul Grieco of Terroir Wine Bar in New York City, there’s the annual “Summer of Riesling” festival/promotion, which hammers home Riesling’s hot weather attributes. It has grown from an initial “Riesling only” by-the-glass program at Terroir in summer 2008, to an increasingly global marketing phenomenon supported by the world’s major Riesling-producing regions, including Germany, Alsace and the Finger Lakes! Willi Schaefer is an outstanding Mosel producer, located on the steep slopes around the village of Graach. I was introduced to Schaefer some years back by the Riesling geeks at Crush Wine and Spirits in New York City. And, in fact, it was Crush’s on-line crowing about the splendid 2011 vintage from Schaefer (as well as from Prüm, Dönnhof and others) that motivated me to drop by and pick up a bottle. I happened to be in Germany last August touring vineyards, right in the middle of the record heat wave. This no doubt added some ripeness and richness to the vintage, but a near perfect September and October imparted finesse and balance as well. 2011 is one of those rare years where both quantity and quality are exceptionally high, across the board, making German Riesling a slam-dunk choice for summer 2012. But there is also great aging potential from the better properties, like Schaefer. 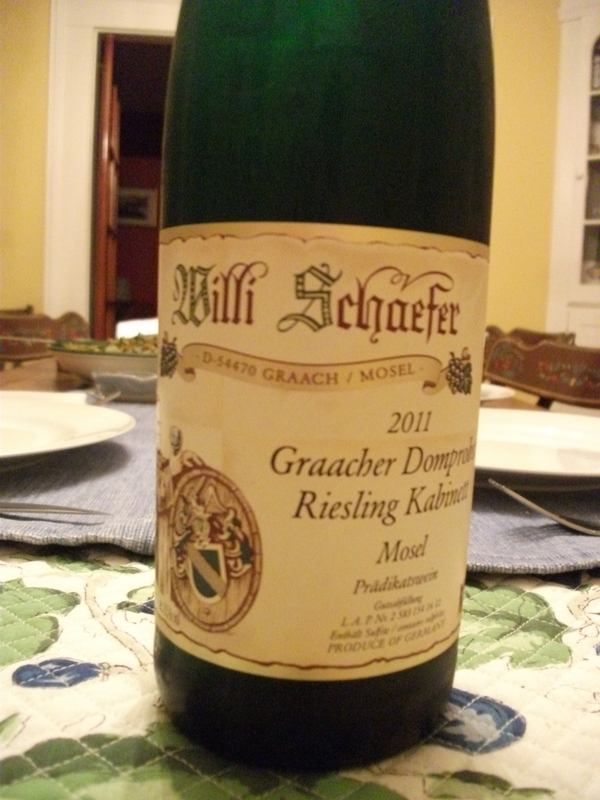 The 2011 Schaefer I recently sampled was the 2011 Graacher Domprobst Riesling Kabinett #16. Full of stone fruit and orange grove aromas, this energetic, focused wine possesses pretty nectarine and plummy fruit, underpinned by clear citrus notes and a mineral core, finishing incredibly clean and long. Beautifully balanced, this Kabinett has refreshing, rather than enamel-stripping acidity, making it totally gulpable in the heat. But you can also think long-term: this one will reward some time in the cellar, too — a complete package. Available at Crush in Mid-town Manhattan for $22.95. This entry was posted in Travel, Wine and tagged Crush Wine and Sprits, German Riesling, Mosel Valley, Summer of Riesling 2012, Terroir WIne Bar NYC, Willi Schaefer, Willi Schaefer 2011 Graacher Domprobst Riesling Kabinett. Bookmark the permalink.